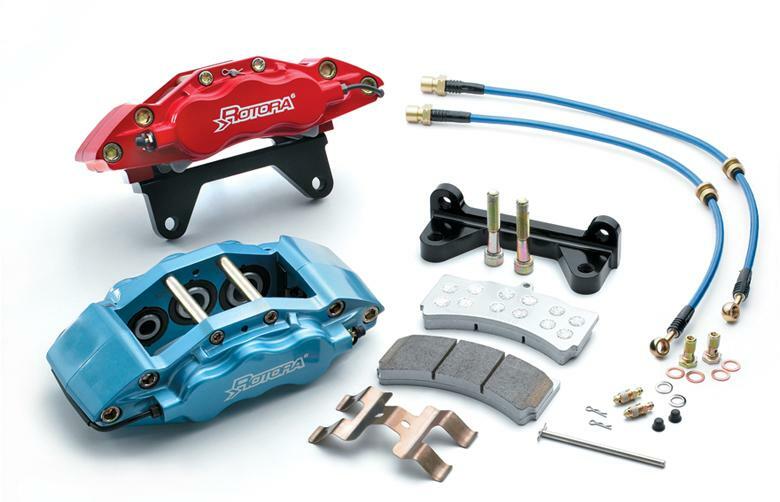 Rotora Brake Caliper Kits - Dezod Motorsports Inc - Home of the automotive performance enthusiast since 2002. Rotora Brake Caliper Kits offer a cost effective solution to maximize braking performance by utilizing the vehicle’s original brake disc. Designed to fit under stock sized diameter wheels, Rotora’s Brake Caliper Kit delivers superb braking power and exceptional modulation and appearance. Rotora’s Brake Caliper Kit utilizes the stock master cylinder to retain overall front-to-rear brake bias. All systems are ABS compatible and direct bolt on replacement with very minimal modifications required. Custom Caliper Color: Dark Blue, Chrome, Gunmetal, Gold, Silver, Black, or Yellow (lead time of 60 days depending on application).